Ft. Worth, TX – February 11, 2018 –Hi Everyone, many of you have had “future champions” hit the ground already and you’re choosing which stallions to breed to in 2018, an exciting time for sure. As these foals arrive you start thinking about futurities to compete in this fall so let me give you the latest news regarding the WCHA BREEDERS CHAMPIONSHIP and WCHA BIG MONEY FUTURITIES. We’ve added a third day so the dates will be Sept 21st, 22nd and 23rd, held in conjunction with the APHA World Championship Show and the APHA Platinum, Gold and Silver futurity program. To make it easier on exhibitors we’re adding a color division within the junior weanling colt and junior weanling filly classes. Junior color horses will now compete within their own class and DO NOT have to come back after the completion of the senior class to compete again in a separate color class with older more mature senior horses. Easier for exhibitors but MUCH easier on the weanling to only show one time. Adding Roan horses to the color division within each of the WCHA Breeders Futurity classes. See Rules on entry form. Roan horses will compete with horses with APHA, ApHC, PHBA, ABRA registry. 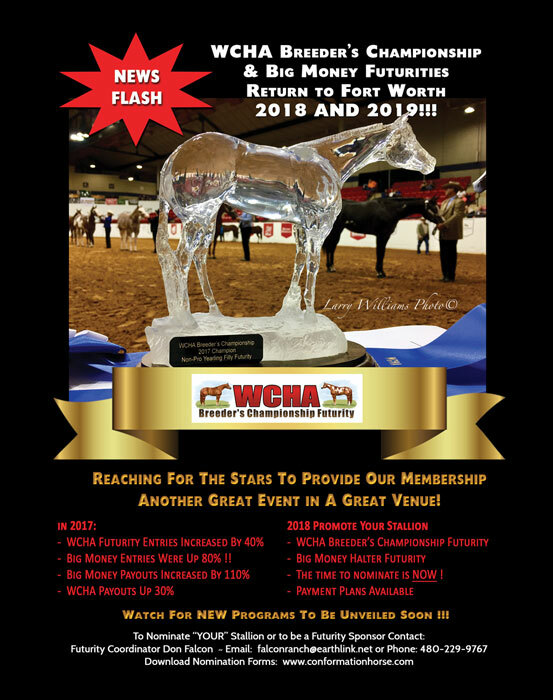 $100 of every stallion nomination will be allocated as added money to color divisions in both the WCHA Breeders Futurity and also the Big Money Futurity, we have also restructured the entry fees so that more money is paid out in the color classes. We had a HUGE increase in stallion nominations and futurity entries within the BIG MONEY FUTURITY in 2017, 100%, so we are adding a junior division for weanling fillies and colts to the BIG MONEY !! This will allow mare owners and exhibitors to bring another futurity entry, give stallion owners opportunities to sell foals born after the March 1 foaling date and give trainers opportunities to fit and condition additional futurity horses. We encourage everyone to support these junior classes, with additional entries these classes will pay just as well as the senior classes. But this isn’t all…… we are about to unveil a performance class, “Conform To Perform”. More info coming soon !!! Stallion Nominations are coming in much earlier this year with new stallions added daily/weekly………Show your support to the stallion owners by breeding your mare(s) to one of the nominated stallions !! Our Nominated Stallions list is being updated daily. CLICK HERE to go to the list of Nominated Stallions now. Any questions you may have about nominating your stallion, how to become a futurity sponsor or competing in the futurity contact me at falconranch@earthlink.net.